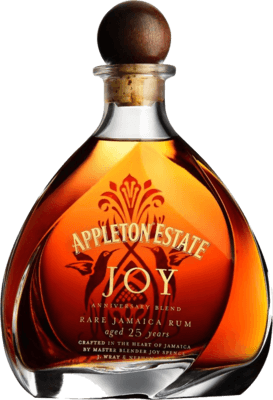 Have you found an online vendor selling Appleton Estate Joy Anniversary Blend? This is labeled a twenty five year old rum, but is a blend with thirty and thirty five year old rums in it also, they labeled it twenty five as that's the youngest rum in it. This is the tastiest rum I've tried, it has great legs, taste and one of my favourite features, the slow smooth finish that tastes of honey. As I sip from my glass, I savour it with the thought that I wish I could afford to drink this delicious rum everyday! I had this side by side with the Appleton 30 year. Both are exceptional Appleton rums. But to me this was even better than the 30 year. Smells and tastes of oak, almond, butterscotch, nutmeg, orange peel, and vanilla. This has just a bit more almond and orange flavor and a bit less oak than the 30 year, which is why I think I like this a little more. If you like the Appleton rums, I'm guessing you'll love this one. I'm not a huge fan of the Appleton style, as I find them a bit too dry for my liking, which is why I only rated this an 8. Still the best Appleton I've had, and if you're a fan of their style, I'm sure you'll love it! I'll fill out this review more soon. I'll second Tom by saying this is the best rum I've tried. The first few sips are layered but gentle. What really stands out in my memory is the honey aftertaste. The aftertaste was like I'd just washed down a literal spoonful of honey. Absolutely incredible. I bought one bottle when it first was available and just got a 2nd today as a birthday gift for myself. The packaging is very nice and the bottle is special and feels great in my hands. Wonderful aroma, slight vanilla and citrus at first and a little oak. Very long legs in the glass. Not sweet at all and not thick in the mouth. Just the perfect mouth feel. The finish is pleasant with what I will say is a dunder component to it. I say dunder because that is how this was described to me when I tried the Mezan XO. That rum has overpowering dunder but is very mellow and pleasant. It actually lingers and keeps reminding me to try some more. After finding out from the “LC” that they would not be carrying this product (Brutal!!! ); I was able to nab three of these bad boys in South Carolina. I am glad to report that if your a fan of the Appleton line; you will not be disappointed. For a rum that has been aged between 25 to 35 years; they have managed to keep the oak under control. All the signature Appleton taste and smell is there as well. For me this is almost a 10 but I think I will give it a 9 1/2. I just wish there was something else on the finish other then oak. My wife and I opened this on our 9th wedding anniversary, so from this point forward; this will only be sampled on future anniversaries. Dieser Appelton hat das gewisse Etwas und der Preis ist moderat für diese Qualität,da hat sich Joy wirklich nicht zu ihrem Jubiläum lumpen lassen.Gefühlsmässig stecken da ein paar wirklich gute alte Jahrgänge drin.... Den 30er braucht man hier nicht mehr zu kaufen.Beim 50er kann ich nicht mitreden aber der Preis ist so utopisch,so gut kann ein Rum gar nicht sein.Dem Hören nach ist er jedenfalls sein Geld nicht wert,der Joy aber absolut. I first tried this in a bar in a great little bar called "The Brig" in Falmouth, Cornwall, UK. It cost £30 for a shot, and was served with spring water, dark chocolate and something else which I can't remember. I remember beig quite staggered at how incredibly long the finish of this rum goes on for. (I walked a mile or two afterwards and was still tasting the linger notes of truffle and earthiness. So, I decided to buy a bottle of my own. No small decision, given the price and availability of it. I eventually paid around £220 for one. I found that my bottle did not have the same taste experience as the one in The Brig. I never quite got the same earthy, truffley notes that I did the first time. Perhaps it is the amount of exposure to air which made the difference, I really don't know. Anyway ... It has much the same basic characteristics of Appletons 12-year old rare blend, but feels a little more finely tuned, as you would expect. The oakiness is there, but unlike the 12 y/o, it is balanced perfectly into the mix of vanilla, brown sugar and caramel. There is considerably less burn than the 12 y/o, so no ice cube needed to soothe the burn. I think that one really special aspect of this rum is the way the flavours transition in your mouth. It's like one note begins to fade just as another builds and comes to the fore. It really is a taste journey. So why only 8 out of 10? ... the price. Maybe I'll get another one, but I have a lot of other rums to try and I could buy several of them for what a bottle of this costs. That said, if you have the means, it is definitely a rum you should try before you die. This stuff is very good . On the nose definitely orange and bannana. We are fortunate to live in a time of Joy Rum. There will be a time when these bottles disappear in the wild. For the current moderate price an amazing long aged rum that is quite possibly the most delicious and exquisite available now. The real kicker is that it is reasonable in price that I am going to bunker a couple extra to last as long as I need it to last. The cost is high but well worth it as this is a delicious rum with a nice smooth taste a slight bite to remind you this is a pirate's drink. Very flowery nose of pear and pinapple, with a rich amber color. Full mouthfeel with caramel, and quite a lot of spice. Nice balance of alcohol and fruit. Not terribly sweet. rich and spicy finish with a touch of burn in the throat on swallowing, a lingering spice in the mouth. Truly this is well made, and complex rum. I can see many loving this, and without question, I would never deny an offer of some. I'm enjoying, but not gushing over it...honestly, I'd need some levening of the spice to give it any higher rating. It’s much alike the 21-year old, but much smoother even though it’s 90 proof. Another difference is the taste of ginger and species. Unfortunately it’s becoming harder and harder to find, so if you get the opportunity to buy one do so if you can afford it. Purchased a sample from Master of Malt for £17.61 and well worth it no10 on today's sampling and retailing at £238. Very refined and complex nose fruity and smooth without a hint of ethanol there's some tropical fruit subtly on the nose. It's complexity in the mouth is unreal fruit, oak, smoke and spice wallop you straight away tapering off to an ultra smooth and long finish. I was lucky enough to try this outstanding Appletons rum yesterday and what a treat it was ! Beautiful packaging and very unusual shaped bottle with a good solid cork. When poured it was left in the glass for 30 minutes just to sit. Wonderful mahogany colour with long , long legs and the smell , wow , i just could of sniffed it all night. As Earl commented .. it has an aroma of orange and honey but not the overpowering kind , just beautiful. My first sip was as good as the smell , warm,, spicey with a well balanced oak taste, sweet but not artificially so.. chewy honey and orange zest , no burn with the finish and an extra long very pleasant aftertaste. Its 45% so a bit of extra strength which really helps bring this lovely rum to life.. If your an Appletons fan then i suggest you beg , borrow or steal a taste of this ! Or if you normally like sugar bombs rums then maybe its not your thing but don't score this low because of your sweet tooth !!! Enjoyed a glass of Appleton Estate Joy Anniversary 25y Blend while vacationing in Brussels. Lighter side of a semi dark color. Very nice and unique bottle design compared to the typical boring Appleton Estate bottles. Very strong alcohol to the smell test. Slightly smoother than your average Appleton Estate but still more or less the same basic stuff in a fancier bottle. Hard to imagine how it has this much burn for a 25y old rum. Afterburn is strong and long. Oh yes! This rum seems to bridge the gap between smooth and sweet. A damned fine expression from Joy Spence! The only thing I do t like about this rum is the shape of the bottle. It’s kind of cool, but it’s got too many sides to flush up in my rum bar. ( BFD, I guess ) This rum bridges the gap between silky smooth, honey sweet and oaky aged Jamaican funk style rum. Excellent!! Go get yourself some funk! I'm not a fan of Appleton's rums in general so I'm sure this would be a 9 or even a 10 for someone who likes that distinctive Appletons flavour. That being said, they've done a great job with this! The combination of a little extra strength (it's 45%) and the age of the rum means they've created an incredibly full flavour profile that develops in the mouth over time and the longest finish I've experienced with any rum. A quintessential sipping rum that should never be mixed! Expensive, but well worth it - not only does is taste great but when you open the box it presents very well. Im no good with describing flavors but to me its typical Appleton's - not overly sweet, with oak. Great rum. Just tip it in ya. 45% ABV. 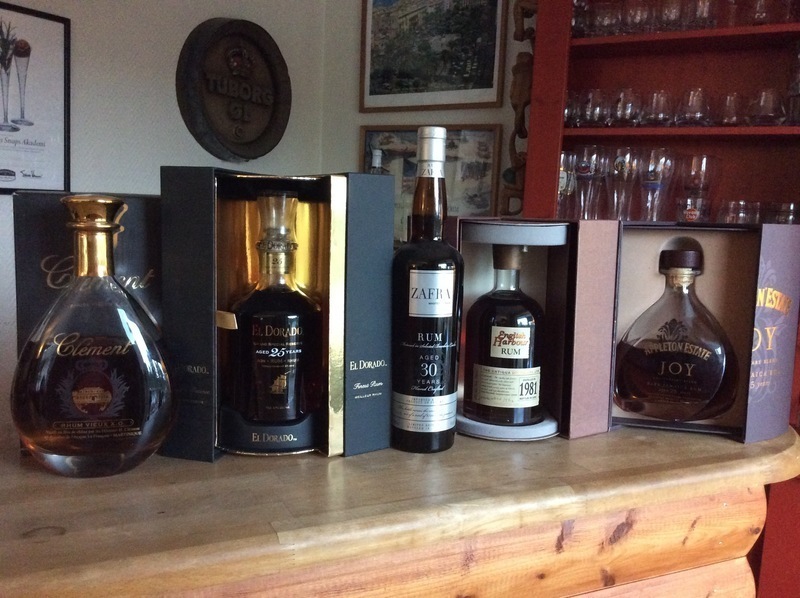 The Christmas Eve (final) box in the 2017 DbtD rum advent calendar. "Joy" to the world? No nose at first (? ), but steadily emerges. Deep and rich. No alcohol notes. Dried fruits. Apricot, pineapple. Oak. Mead. Later, brine. Very deep, and satisfyingly rummy. Fruity palate. Slightly bitter. Hefty tannins. Sherry. Long finish. Lots of flavors here. Very complex, super tasty. Appleton Estate Joy is pure rum perfection. It is richly sweet, complex, fruity, woody, and all without any additives. I cracked this open to celebrate a very special occasion and it was well worth the effort and the celebration. Worthy every penny. This is as good as rum gets. Sugar: estimated at 14 gpl. It’s doubtful that I will get a chance to taste the 30 or 50 year old Vintages which is why I give this 10 rating. 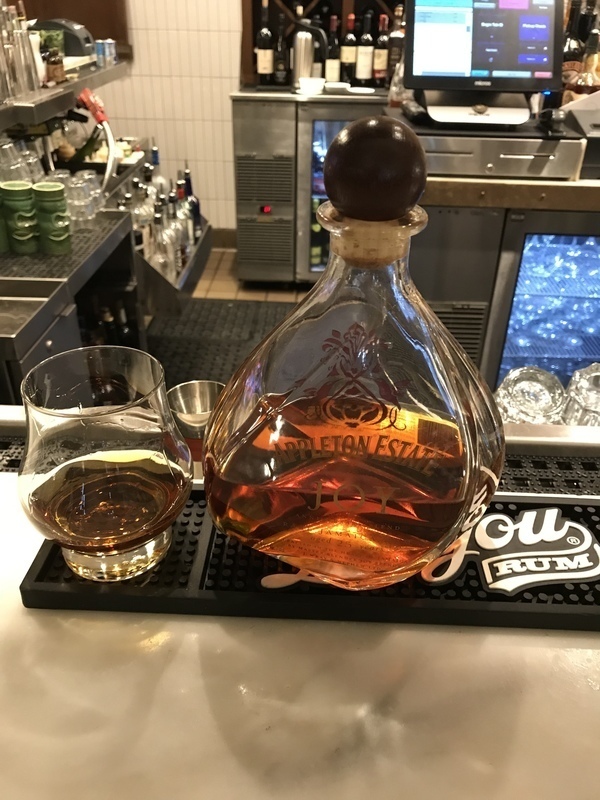 The standard Appleton taste profile of oak, smoke, and vanilla is present but this rum has a honey and orange taste that smooths and balances the rum. It’s a masterpiece of rum blending and is a must have for Appleton rum lovers. I forgot I tried this (telling), and gave it another go. Smooth and light, but BITTER. Oak and smoke, but nothing interested. In fact, it reminded me of burnt rice. My original review is below. 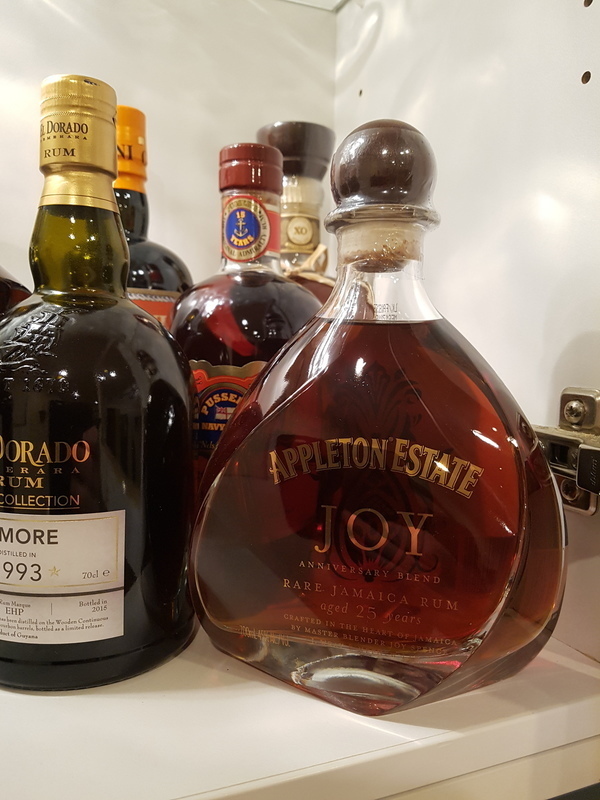 Tried it side-by-side with Appleton Reserve Blend as a current base/standard for Appleton, and also the Appleton Estate Very Rare Limited Edition 30 Year, what I thought would be its nearest peer (I don't have the 21 on hand). By far this 25yo is the most mellow. In a watered down sort of way, not an elegant way. Has the least flavor, seems the least Jamaican of the three. Oak on the nose, disappointment on the tongue. I can find the W&N funk in the Blend, and the aged richness in the 30, but nothing to write home about with the 25. It's good rum, but I just can't justify past a 7. Maybe I got a bottle that was off? That would be a shame.